The Roland Blues Cube amplifiers ship with a sweet vintage tube tone right out of the box. 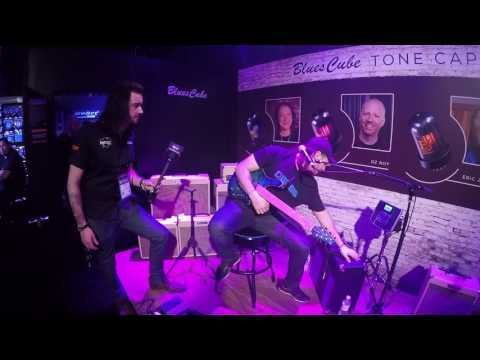 Eric’s custom Blues Cube tone, however, is avai.. The Roland Blues Cube amplifiers ship with a sweet vintage tube tone right out of the box. Eric’s custom Blues Cube tone, however, is available in a new and exciting product: the Eric Johnson Tone Capsule. The Tone Capsule is a modification circuit unit that changes the tube circuit characteristic of the original Blues Cube and attaches under the amp chassis. The Tone Capsule looks like a guitar amp tube, but is actually a capsule that modifies the sound of your Blues Cube, to give it a even more valve-like tone. This is another innovative and revolutionary concept by Roland. Once connected, the circuit modification on the Tone Capsule changes the tuning of the amp giving you custom tones and responses. The Tube Logic design physically amplifies the analog discrete circuit with characteristics produced by DSP circuits. Blues Cube’s basic sound quality is built upon the physical preamp and power amp. The analog discrete circuit and DSP circuit working together produce a very advanced path to tone. Carefully connecting an oscilloscope to Eric’s amps gave the team a clear view of the waveforms detecting properties such as amplitude, frequency, rise time, time interval, distortion, and other factors. Eric commented, “We’re checking out some of my old amps and trying to infuse that into the Blues Cube, and right out of the shoot it’s working pretty well. It’s surprising. I think the response is more tube-like than it is solid state.” Bill and the Blues Cube engineers further discussed the guitar response. Bill wanted to know how Blues Cube was able to react like Eric’s amps. The engineer explained, “The Blues Cube creates real power sag in each circuit and component by dropping voltage of the power supply and intermodulation of power supply frequency, condition of the screen grid voltage and pre tube voltage.” This was a deep exchange of knowledge concerning Blues Cube modification.